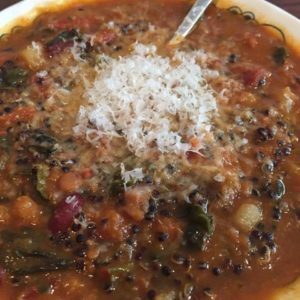 Yoke's MINESTRONE with sprouted black quinoa, lentils, beans and cavolo nero This is not a precise recipe like my sourdough bread or cakes... I hardly ever use recipe when I cook (too hard, too lazy). So taste often and use your instinct... experiment, you can't go wrong with minestrone... I find this soup taste best the next day... add more water every time you warm it up, and stir to stop it burning on the bottom...I like my minestrone thick! Grate some good parmesan cheese Add finely chopped slivers of cavolo nero or silver beet Cook some more until cavolo nero is cooked.